Precalculus – Dual-credit online class through LeTourneau University – LeTourneau is a college we are looking into for Dusty. When we found out that they had dual-credit online classes for half the cost of another online class we considered, we decided to give them a try. Center for Lit English classes – Dusty has taken their lit classes for two years now, and this year we decided to consolidate and use their writing component as well. Dusty will be doing American lit, to coordinate with his American history. We love the lit teaching from Mr. A. I’m interested to see what the writing classes are like. 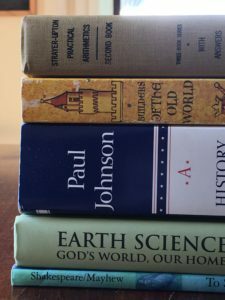 Paul Johnson’s History of the American People – I heard this book recommended on my homeschool forum, as well as by Libertarians who share our perspective on government. I like how it approaches history through the stories of people, rather than events or facts. This will be a simple homemade course, with an essay assigned for each of the eight sections. Earth Science – Since Dusty plans to go into aviation, and he has not had a formal year of earth science, we decided to go the unconventional route of doing it for this junior year. We are using Novare’s Earth Science textbook, supplemented by a few living books and a Great Courses course on Extreme Weather. After looking long and hard for an online course at his level, we decided just to do it at home. Space Exploration Science – Online class through Excelsior Classes. This one-semester class will mesh very well with our earth science course. Tommorrow’s Filmmakers – Online classes. His first elective. Dusty has a keen interest in filmmaking, and these self-paced classes look exellent. They come from a Christian perspective. This will also fulfill the need for a credit in fine arts. Another elective may be pursued later in the year. His extracurriculars will again include piano, choir, handbells, and Civil Air Patrol. He has started working this summer for a lawn care business. Strayer Upton Math, 2nd book – This will be our 3rd year doing SU math with Duncan. It has been going well. CM skills & one book of Writing Trails – in addition to copywork, dictation, and narrations, we will go through one Writing Trails booklet. These teach the skill of rewriting paragraphs through key word outlines. It has some similarities to IEW, but without the elaborate formulas. Exploration Education for science – He has been looking forward to this physical science program that includes many cool hands-on projects. I love that everything comes with the course. 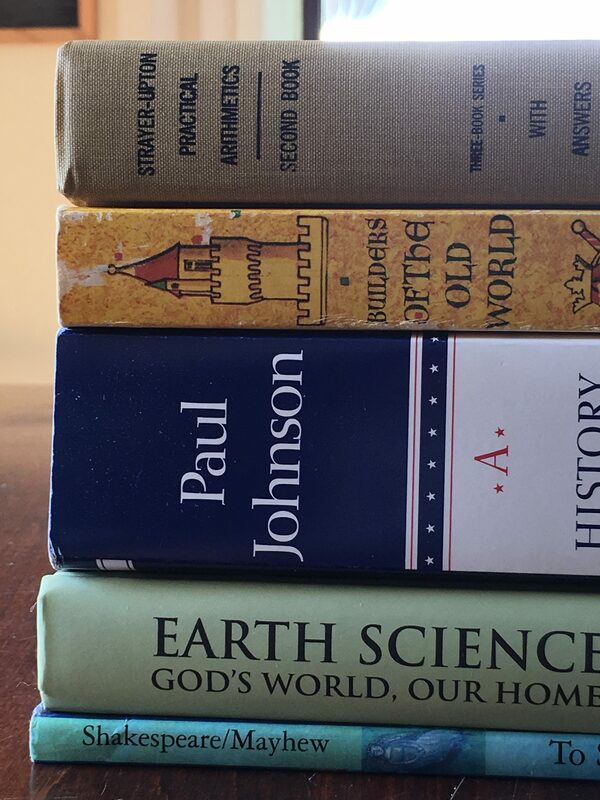 Builders of the Old World and Makers of the Americas – World and American history with lovely old living books. La Clase Divertida – his third year with this fun program. Recorder, and perhaps piano. I would like to do art with him one semester, and outsource the other one. Baking! Hoping he can take over the weekly bread baking from his older brother.